After the 2012 election, which saw Colorado become the first state to legalize marijuana, Gov. John Hickenlooper (D) said he probably would have reversed the vote if he had a magic wand. 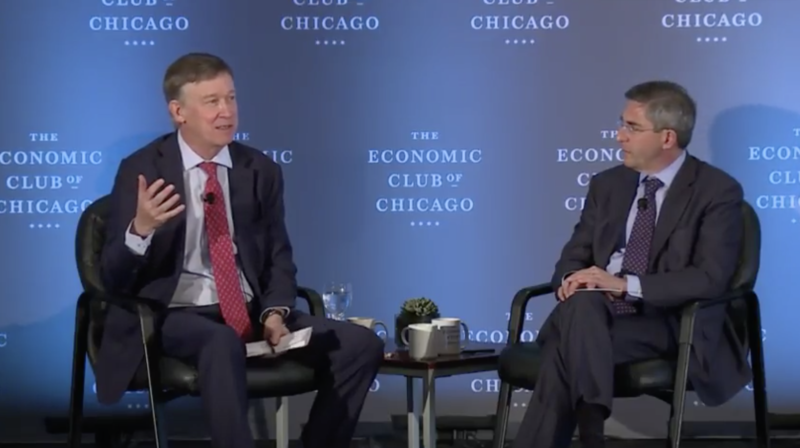 “I’m not quite there to say this is a great success, but the old system was awful,” Hickenlooper said at a forum hosted by the Economic Club of Chicago on Wednesday. What’s more, “the things that we most feared—a spike in teenage consumption, a spike in overall consumption, people driving while high—we haven’t seen them,” he said. But he pushed forward with implementation, recruiting the “smartest people” he could find to figure out the best approach to regulation and taxation. And Illinois, which recently elected pro-legalization J.B. Pritzker for governor, will likely be better off if they pursue reform because they can learn from the successes and failures of Colorado’s system, Hickenlooper said. Asked what advice he’d give to Pritzker if Illinois does elect to fully legalize cannabis, Hickenlooper offered three tips: 1) don’t overtax marijuana, or else the illicit marketplace will persist, 2) get data from law enforcement on the presence of cannabis metabolites in the blood after highway fatalities to establish “good baselines” for comparison and 3) set limits on THC concentrations in edibles. Photo courtesy of YouTube/Economic Club of Chicago.